Learn the basics of painting on ceramics, glass or any nonporous surfaces. Alcohol ink is very similar to watercolors and even if you can’t paint, YOU CAN DO THIS! 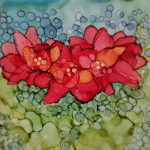 This is a fun 2 to 2 ½ hour workshop that will inspire you to bring out your creativity! Join us for a fun workshop. All students must be registered and paid. No walk-ins unless prior arrangement has been made.